Planning for this year’s edition of Greenfest began in the waning stages of last year’s festival. We knew we wanted to keep the same vibe, but ratchet it up just a notch. Greenfest has always been a different type of festival. A unique blend of exposure to new bands, jamming to familiar favorites, offbeat family reunion and good-times revival. No matter the venue, line-up or location it’s always held true to the mantra of for the fans, by the fans. Each year we gather input from other fans and winnow everything down into a potent mix of awesomeness as best we can. There are bedrock Greenfest artists that will be with us every year, and many new acts each year who could very well be the next big thing. Turnpike Troubadours in 2010 comes to mind. They played early on the bill to a middling crowd. 12 months later they were headlining the biggest stages in the scene. 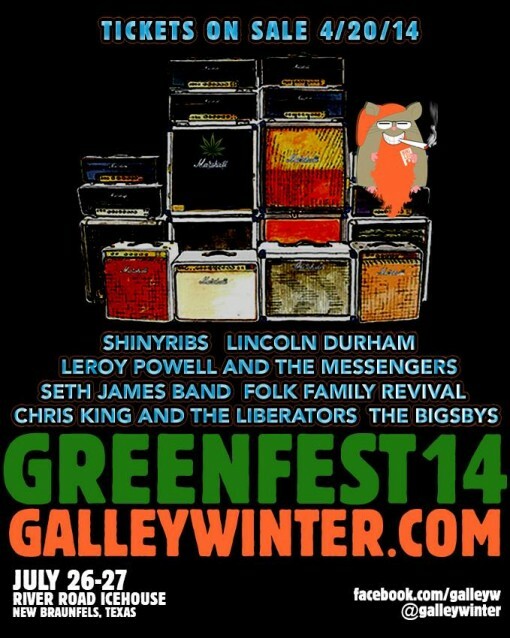 Greenfest 14 will once again take place over 2 days in New Braunfels, TX. Tickets, $15, for Saturday will go on sale April 20th. Sunday, as always, is FREE! SAT JULY 26 at River Road Icehouse: Shinyribs, Lincoln Durham, Seth James Band, Folk Family Revival, Leroy Powell and the Messengers, Chris King and The Bigsbys. Full (and one-man) band shows. Loud, live, electric and rockin’. SUN JULY 27 at Lone Star Floathouse: Walt Wilkins, Drew Kennedy, Adam Hood, Josh Grider, Ben Danaher, Kylie Rae Harris, Jamie Wilson, Kelley Mickwee, Nate Rodriguez, K Phillips, Aaron Stephens, Bobby Duncan, Mark Allan Atwood, Jordan Minor, Brandy Zdan, Jonny Burke, Dan Adams, Justin Bravo and a few surprise guests. Acoustic, soulful, friendly, church. FREE. But, please bring your tipping cash for the bands! We’ll have plenty more details and fun contests coming your way. But there you have it. Make your plans now! B-DAY WEEKEND CAN’T WAIT. SHINY RIBS & FOLK FAMILY ON THE SAME DAY!! HECK YEA!! CAN’T WAIT!! Greenfest is a fest like no other. Great talent and atmosphere. Feels like home….with great music…and all your friends. Can’t wait! I am looking for a few places for my 2015 tour.So let me ask you. Would SOUTHERN ROCK and Blues. Be something you’d love at this festival? I have never been in your area.But I would be willing to check it out and play some music for everyone if possible.Message me back with dates and times for next yrs show case.Hopefully we can work something out. Thank you and have an awesome day. Big Nick. These footwear have earned a name for themselves as builders of excessive feature shoeswhich can be constructed for rugged outside and athletic functions. I simply want to mention I’m new to blogs and actually enjoyed your blog site. More than likely I’m likely to bookmark your website . You actually come with incredible stories. Regards for sharing with us your website. This is a terrific post and I am glad that I found your website. I have actually been seeking information on this topic for the last couple of days and also was happily amazed to discover it on your website. I hope to be back over the next couple of months to see if you have any kind of other items of details that might help me. Thanks , I have recently been searching for information approximately this topic for ages and yours is the best I’ve discovered so far. However, what about the conclusion? Are you positive about the supply?